The past few weeks have been challenging at the Jabulani orphanage. Our Jabulani carers and HESC curators have had to pull out all the necessary stops to pull Raekie through a difficult time. She has recently endured heavy spills of diarrhea and bacterial infections that we have been fighting with very specific antibiotics, as the bacterial infection is resistant to some antibiotics. Of course, with heavy antibiotics, the flora in Raekie’s stomach also had a setback even with additional probiflora added to her diet. Luckily, with Dr Peter Rogers and the results we received from the dung samples we sent in, we managed to overcome this bacterial infection after a few series of antibiotics. Fixing one problem, though, did create another problem. Raekie’s condition deteriorated as she wasn’t feeling well, didn’t want to finish her milk and therefore was not getting her full spectrum of feeds, to keep her basic health condition up to standard. It started when Raekie didn’t want to take all her milk and began to drink less and less. We could see how she was slipping and losing interest in things she usually cared about. Things got worse when we noticed new teeth erupted, cutting through the gums. Luckily, teething doesn’t last forever, but at this stage it was crucial that Raekie drank her milk. Teething caused a new set of diarrhea and her condition worsened. On the 25th of February, Dr Rogers and Janelle came to give Raekie a drip. She was dehydrated and although a standing sedation is less traumatic than a full sedation, a sedation, especially with an animal that is not healthy, is a huge risk. Raekie received three litres of Ringer’s (Ringer’s solution is a solution of several salts dissolved in water for the purpose of creating an isotonic solution relative to the body fluids of an animal and it helps to balance the pH in the body) and three litres of Maintelyte (which contains glucose and is used for the treatment of fluid loss and helps with electrolyte imbalance). 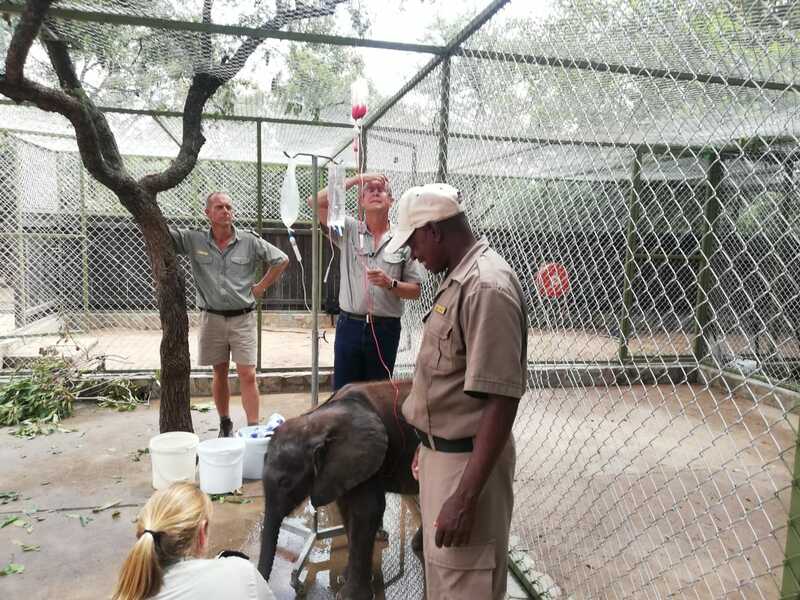 We also added vitamins – including vitamin B.
Raekie’s favourite Jabulani elephant carers were called in to assist, as this was no time to play around. It also created an opportunity for our newly-appointed elephant carers to learn from the best in how to deal with sedations and the after-care. Another round of fluids and vitamins were administrated on the 27th of February – six litres of fluid with vitamins and minerals. Things didn’t improve dramatically and I asked Dr Peter Rogers to do a blood transfusion. On the morning of the 28th of February, Setombe was sedated and she donated two litres of blood for Raekie. The Jabulani herd has played a tremendously important role in assisting with by-products for the elephant orphans. The value of the fresh elephant dung and the blood donations we are able to get on request, are extensively helpful. There is no specific reason that Setombe’s blood is compatible with the little ones, however the reason we usually use Setombe, is because of her position in the social structure of the herd. She has her calf, Klaserie, and as she is not one of the matriarchs, it is easier to take her to the side, without affecting the herd. She is also a calm elephant with an easy-going personality. Seeing to it that Setombe is fine and joining the herd on the reserve, feeding for the rest of the day, Dr Rogers and Janelle left for HESC. Joshua Dube joined them, as Raekie is fond of him – he was one of the carers she first met – and needed as much comfort as we could offer. Four bags of blood doesn’t sound like much – it is only two litres, but I promise you that waiting for the four bags to fill and waiting for the bags to empty feels like an eternity… The fact that Raekie was sedated for the third time in less than a week did not help the situation and you could feel the stress levels from everyone soaring. Another two litres of Ringer’s and two litres of Maintelyte and another vitamin boost followed during the blood transfusion. Raekie was not interested in her milk for the next bottle feed, however, shortly after we could see her coming to life. Her energy slowly picked up and she started to be more inquisitive again. She started slowly taking her bottles, but was not finishing and in the beginning only took a few sips. Kenneth, Joshua and Reply kept following her with the bottles to see if she would be interested and over time she slowly took more milk. Now she has started to wait for her bottles with Mopane and her energy is looking much better. She is not on a full bottle yet, but she is doing much better.